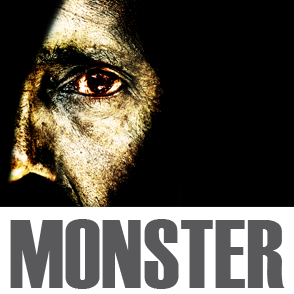 Monster is an ambitious staging of Mary Shelley’s Frankenstein. At its best, the tale can be a window into the theme of the messy pain of creation and abandonment from God and/or our parents. Instead, Neal Bell’s script haphazardly throws in explorations of sexuality, suppressed homoeroticism, lust, and societal inequality, and director Jim Petosa uses the script as a blunt instrument. Petosa’s staging, while visually energetic, and Bell’s script create some wonderful angst-ridden moments that might be good monologue material for young actors at mass auditions, but in combination create something unformed and at times embarrassing. It’s all over with the shouting, and the shouting begins with the first scene. It makes sense that the first two characters need to shout to hear each other, since they are on an ice float with the cold wind whipping all around them. But the shouting brings diminishing returns as the play continues and leaves the actors nowhere to go when emotional energy is really needed. Petosa seems to play to what he perceives as the strengths of the enthusiastic cast. It’s one of those frustrating mysteries of theatre, trying to tap the precarious balance between youthful enthusiasm and veteran skill. The cast, made up mainly of Boston University students along with two pros, give it their all, tumbling, crouching and bearing and beating their bodies and vocal chords to try and make the production work. But while their performances provide some spark of life to the production, the cast too often must resort to volume, fake laughing and preening in sweeping capes. And the action is staged with such abandon that spittle flies from the mouths of actors and audience members nearly get showered with supposed lamp oil, as if this were some kind of gothic Gallagher concert. The understated set was nice to contemplate in the chaos, as was the adequately somber mood music. And at least the shouting helped draw out the power of the few quiet scenes, with the first scene between Victor (Michael Kaye) and his creation (John Zdrojeski) standing out as a nice shared moment of pity and bewilderment. The diamond in the ruff of the production may be how Britian Seibert turns in an encouraging performance as Victor’s ill-fated love, Elizabeth. As an actress, Seibert may sometimes still be uncomfortable in her character’s skin, but at least she doesn’t cover it up with bravado, and we can commune with her exploration of the unknown. This entry was posted in Drama and tagged 2012, BCAP, Boston, Boston Center for American Performance, Boston University Theatre, Britian Seibert, February, Frankenstein, Jim Petosa, John Zdrojeski, Lane Comley Studio 210, MA, Mary Shelley, Michael Kaye, Monster, Neal Bell, students by craigidlebrook. Bookmark the permalink.